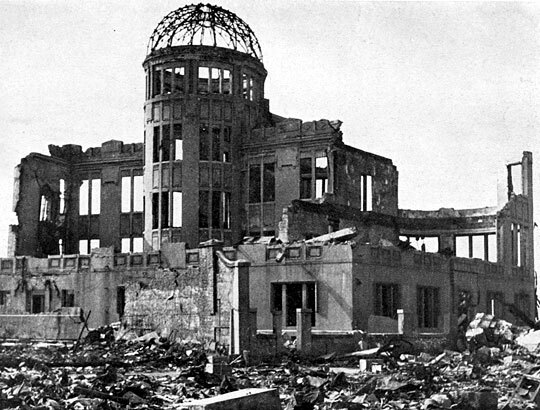 140,000 people died in Hiroshima, as well as thousands afterward from the effects of radiation--cancer, wounds, injuries. This is the first year that an American ambassador is going to the memorial ceremony. I mean, really. It only took y'all 65 years to attend the memorial service--why even bother at this point? On the one hand, as an American-born young woman of Japanese descent, I am glad that my birth country is acknowledging what it did, since it's never apologized. On the other hand, it feels too little, too late. And yes, I've heard (and was, in fact, taught in school) that the Americans felt they had no other choice at the time--either use the devastating bomb or lose thousands, possibly millions, of American lives. I heard one American guy reiterating that opinion on Japanese TV today. Excuse me while my cynicism rises to the surface. That, and a good measure of disgust. Perhaps an invasion of Japan would've lost more American lives. My father's father was in the occupation forces, actually. My mother's father was training. He would've been in the next bunch out of Japanese and into the Pacific islands had the war kept going. My mother's uncle fought in the Philippines and several of the islands--against my Irish-American grandfather. 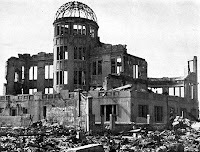 I can't say if the American lives lost would've been quite as devastating in number as the ones lost at Hiroshima and Nagasaki; they certainly wouldn't have echoed down the generations as the bombs did, what with radiation causing cancer, infertility and other diseases over the decades. BUT--I'm not going to argue the faulty policies of 65 years ago. The bomb was dropped from the Enola Gay at 8:15 am. More pertinent to my family is the Nagasaki bomb--because my family is from a nearby city, in the same prefecture, called Sasebo. That one was dropped on August 9, 1945, 11:02 am and it's still within living memory of my family. My grandma was still a teenager at the time, but she remembers seeing the cloud over Nagasaki from Sasebo. The Secretary General of the UN visited the Nagasaki memorial site yesterday, I believe. It's the first time that has ever happened, too. 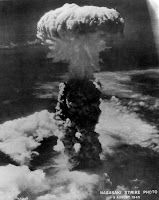 70,000 people died in Nagasaki.